Sign up for a free Dropbox account. This will set up a dropbox folder on your computer. 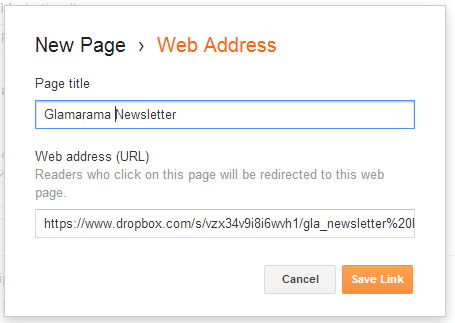 Create your newsletter and save as a .pdf file in your dropbox folder. Dropbox will automatically make a copy of that file online in your dropbox.com account. To add a link on an existing post or page: Just type “Here is our current newsletter.” Select the words, “Current Newsletter” then click the tool for Link, paste in the dropbox link and click OK.
To create a ‘Page’ that goes to the newsletter: From you Blogger dashboard, use the dropdown list and select the option for Layout, then Add a Gadget in the location you want it to appear (tabs under header or list of links in sidebar) choose the “Pages” gadget, then “Add External Link” and fill in the field like the image below. Show the Newsletter on a Blog Post or Page. Copy that code and use Blogger’s HTML view to paste it into the post or page where you want it to appear. You will probably need to adjust the height and width settings in the code snippet. You can see an example of this on a sample page I made using the Fulltime RVers newsletter as a sample. If you are a Geeks on Tour member, you can check out the Blogger Videos to learn the basics. If you are interested in viewing tutorial videos specifically on how to do what is in this article, please comment below. If I get enough comments, I’ll do the videos. Published by MrsGeek, in Blog. Tagged with Blogger, Blogger for club websites, Blogger Gadget, Blogger pages.